Credit Card Online/Phone Payment Options: We accept payments using the following major Credit Cards - American Express, VISA, MasterCard and Discover. Our online credit card processing utilizes the highest level of encryption and security available. Our security is monitored by GeoTrust on a 24/7 basis and can be verified on any page of our website. For your added protection, we do not retain your credit card information electronically. The information you enter in our online forms is encrypted when transmitted from your browser and is protected from fradulent use by our industry-leading credit card processors. IMPORTANT NOTE: We strongly recommend, if possible, using the online credit card payment option (simply check the "Credit Cards Online" radio button on the check out page), as this allows for your payment to be processed within seconds and gets your order to you sooner than any other payment option. As soon as your online payment clears you get IMMEDIATE access to digital downloads, and items that need to be shipped (like the Puritan Hard Drive) are shipped as soon as possible. Making payment using your PayPal account will involve a few more steps than the online credit card payment option and consequently requires a little extra time. When you order by phone or fax your payment clears as soon as we can process the order and it is approved by our credit card processors (which, under normal circumstances, only happens during normal business hours). When you order by mailing in your payment this takes the longest, as your payment needs to travel to our Canadian office (which takes days to weeks depending on your location), then we need to deposit the check or money order (about one to four days, depending on which day funds are received and when the banks are open), and then we need to wait for the bank to clear the funds and communicate this to us (time varies, in amount of days, depending on the currency of the check or money order). The whole process of payment by mail is much slower than making payment online by using your credit card (the preferred method), by PayPal, by phone or by fax - online credit card payments being the fastest and thus the preferred method. An interest free, deferred monthly payment option, starting as low as $US50/month, is available for purchasing the Puritan Hard Drive (all editions). 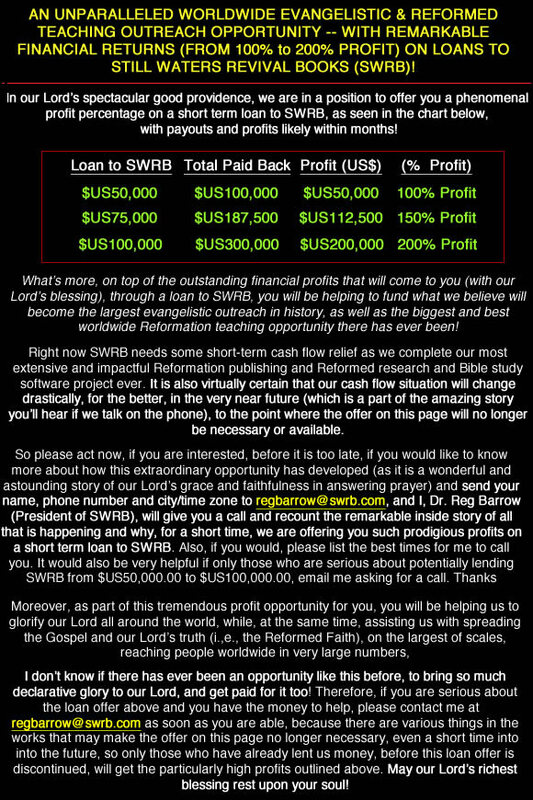 Call 1-780-450-3730 (USA,Canada) or click here for phone numbers for other countries, or use our Secure SWRB Order Form on our swrb.com Web site, to place a deferred payment order. The total deferred payment price for the Single Platform Edition (SPE, either Windows or Mac) or Dual Platform Edition (DPE, Windows and Mac on one USB hard drive) of the Puritan Hard Drive is just $50.00 more than the price listed for a single one-time payment (as this covers our extra administrative and processing charges). (The minimum monthly payment is $US50.00/month, though you have the option to pay more per month, or even make additional payments at any time, if you so desire). The same deferred pricing, adding $50.00 to the total price, also applies to both SPE and DPE versions of the downloadable On Demand Edition of the Puritan Hard Drive (PHD-ODE). Deferred payment orders can not be placed using the "Add To Cart" button on this page, but must be placed by calling 780-450-3730, or by using our Secure SWRB Order Form at swrb.com (at one of our other Web sites). Of course, you save even more by taking advantage of the low Puritan Hard Drive Super Sale price, combined with the big extra discounts in our time limited offer, when you purchase either the SPE or DPE of the Puritan Hard Drive using the one-time full payment option, which can be done directly through the "Add To Cart" button on this page, by phoning 780-450-3730, or by using our SECURE SWRB ORDER FORM at swrb.com. Because ministry is our priority, if you are unable to afford the full discounted price for the Puritan Hard Drive, please contact us with an offer stating what you would be able to pay. The more information you provide as to why you can't afford even the discounted sale price on the Puritan Hard Drive (even using our interest free deferred payment option), and how much you can afford, the more likely it is that we will be able to work something out so that you can obtain the Puritan Hard Drive. If you are truly in need we will do our best, within reason and bounds of Scriptural propriety, to help you. You may also contact us by phone at 1-780-450-3730.